In the lawsuit filed this past week in Ottawa County Circuit Court, Quixtar seeks an injunction and damages of more than $25,000 against the posters, identified only as John Does. Quixtar develops and manufactures nutrition, beauty and cleaning products that are marketed in the United States and Canada through a tiered selling system, hiring entrepreneurs to sell its products. Parent company Alticor Inc. uses the Quixtar name for its U.S. and Canadian direct sales unit and sells products throughout the rest of the world as Amway Corp. Among the products Quixtar representatives sell are Nutrilite vitamin, mineral and dietary supplements, Artistry skin care and cosmetics, XS energy drinks, and air and water purifiers. Alticor, a $6.3 billion company based in Ada, Michigan, announced in June that it will start phasing out the Quixtar name and rebuilding its Amway brand in the U.S. and Canada. Quixtar wants the court to approve subpoenas of various online companies to allow it to figure out who posted the materials, which also include videos posted on YouTube.com. 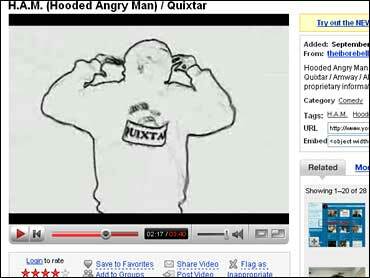 In one video the lawsuit cites, a man wearing a shirt that says "Property of Quixtar" rants about the company. In another, a man points out products at a grocery store priced much lower than comparable Quixtar products. Quixtar believes the videos and other postings are part of an organized effort by former distributors who unsuccessfully sued Alticor and are under court order not to disparage the company or disclose proprietary information, according to the lawsuit. Quixtar plans to ask for permission to subpoena various online companies to figure out who posted the materials, spokesman Rob Zeiger said. According to the Grand Rapids Press, an Alticor representative said the court action was merely to identify anyone who might be associating with those under court order, rather than expressing their own personal opinions. Zeiger told the paper that his company was not interested in pursuing people not associated with the former employees, and would even reimburse their legal fees if there was no connection. "An individual who is expressing their own opinion, we don't have a problem with that," he said. "They're not doing anything wrong." The move comes a week after a federal judge in Los Angeles dismissed a suit brought against Quixtar by a group of independent business owners (IBOs) terminated by the company, who had claimed that the Michigan company is "an illegal pyramid scheme."